"Against twenty Russians trying to shoot you down or even twenty Spitfires, it can be exciting, even fun. But curve in towards forty Fortresses and all your past sins flash before your eyes" ("Fips" Phillips 200+ victories). This is only one of the myriad of quotes from various German fighter pilots about the fear that engulfed them facing the Flying Fortresses. The USAF decided that daylight bombing would allow precision attacks on German industry. This also meant that that the Luftwaffe was able to throw everything they had at the American bombers. This sets the stage for GMT's new game, Skies Above the Reich. The first thing you notice when it is delivered is that it's in a large 3" box that weighs a good deal. Upon opening, you find it contains a cornucopia of gaming goodness. The box is filled to the brim with booklets and charts and two mounted maps. It is a solitaire game that can also be two player (both playing the Germans). 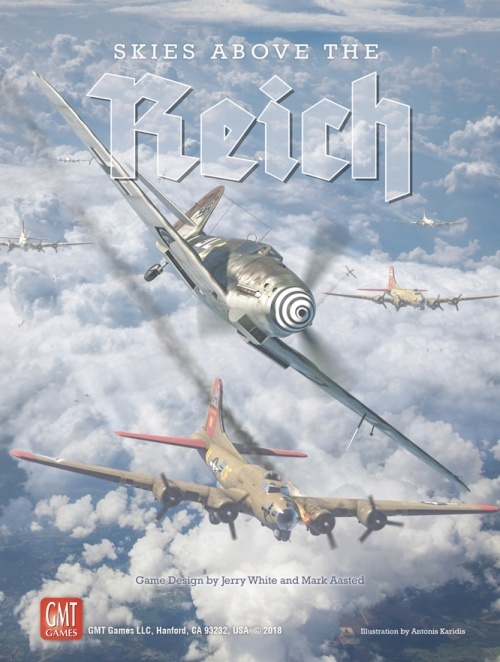 Played as a single player game, you are in command of a Staffel of German fighters trying to stop your country from being bombed to dust. The game starts in 1942 and ends in 1945.
of the Formation Map to another. Box, or from an Evasive Return to a Return Box. fire cannon; then, if Near Target, check for flak. Cohesion - Check each element for cohesion. Approach Box. There are several steps to this phase. As mentioned, the game also comes with advanced rules for you to delve into. The base game is about your fighters trying to knock down Flying Fortresses or just knock them out of the formation. 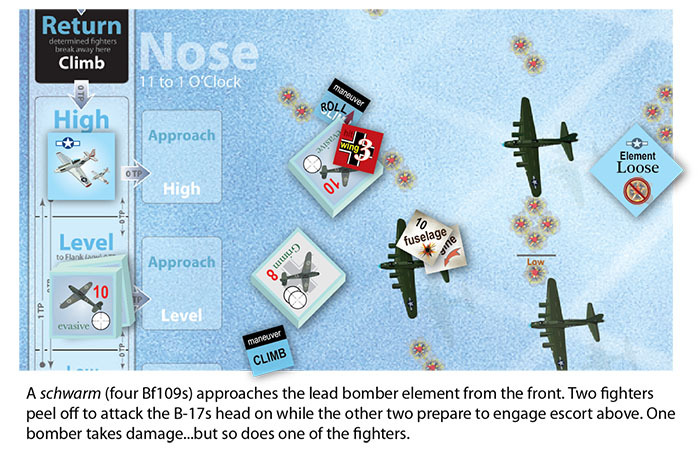 The Advanced Game is where your fighters will attempt to destroy bombers that have been knocked out of formation. 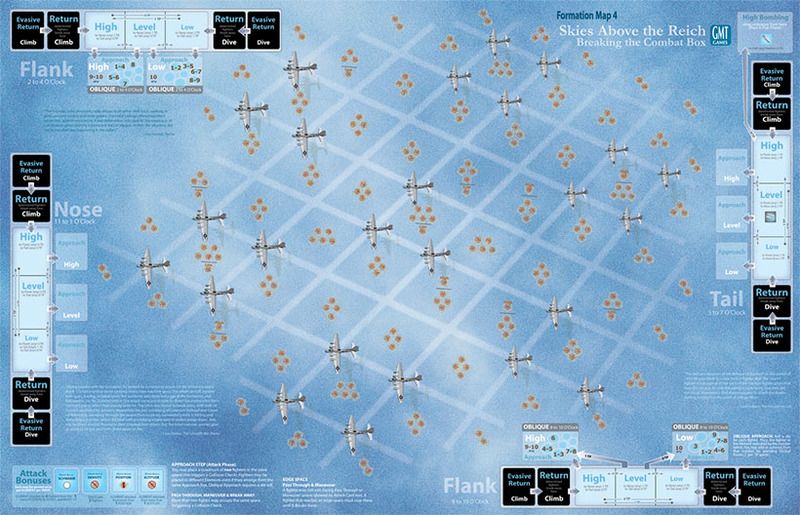 The game uses four maps to show the difference in the Flying Fortress formations during the years of World War II. 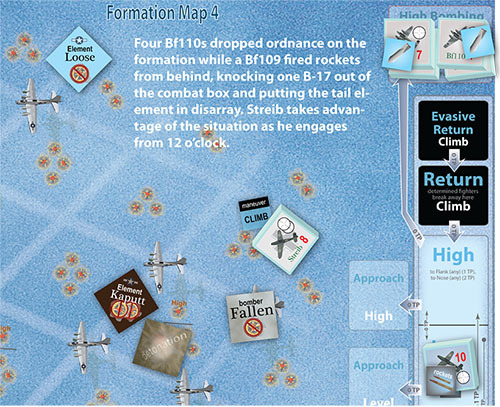 Map 1 is the easiest to deal with and shows how the Allies experimented with bomber formations. Map 4 comes into play after Flying Fortresses were equipped with 'chin turrets'. Until this time the favorite attack of Luftwaffe fighters on these bombers was to attack straight at their noses. The chin turret made these attacks much more dangerous for the German fighters. These types of games have a bit of a double-edged sword to them. You actually play with named units/counters instead of just 'pilot A' or Bf109_, fill in the blank. So, you are bound to get attached to the different pilots. At least I do in a game like this. In Wargames I do not get attached to divisions or corps, but in games with individual soldiers etc, I do, especially if I am playing a campaign and have to husband them through different battles. You will have some of your pilots get lucky to survive numerous battles only to fall at the last minute or just when you thought they had made it safely through another B-17 formation. The rulebook is fifty-eight pages long, but don't let that scare you. It is written in large letters and every page has an illustration or two on it. The rules are very well done and hold the player's hand while teaching the game to them. The rulebook, situation manual, and the player's aids are very easy to read and absolutely full of play examples. The map boards are also very well done and 'clean'. There is a lot of information on them, but it is not jumbled up or seem too close to each other. The components just seem to be very well thought out, along with being very well done visually. Even the artwork on the box is excellent. Some of the counters are 1", so these are easy on old eyes. The counters are done to the standard of the rest of the game. I have older GMT games that were nicely done, but this game blows them away as far as visually and component wise. Game play is very easy to get into. After your first mission, you will probably only have to glance at the rulebook every now and again. The game is set up so that you play out campaigns. Each campaign is a season. You can play campaigns of one season or up to seven. You will use the Mission Set-Up Table to start the campaign and to set-up each mission. Then you will use the Situation Manual to set-up each mission. You will either roll die or us the Staffel Commands to determine various things about the mission such as sun position etc. So with this game you get the best of both worlds. It is a deep game with a lot of options and heavy thinking for the player, but it also plays quickly and cleanly. 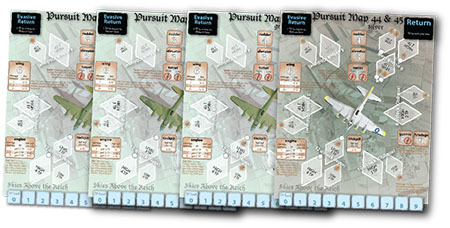 The game's use of a die roll for Mission Type and Operations Points helps to keep the player always guessing and thinking. Do you add armor or cannon to your Staffels planes, or do you try to have your auxiliary planes drop bombs on the Fortress Box? The availability of escorts for the Fortresses also increases dramatically with time. To give you an idea of how tough the war becomes, we will use this example. In 1942 you are given six Experten (Aces) for your Staffel. In late 1944 you are given eight green pilots to start with. Your pilots that survive and are lucky also get to grow through the game. A pilot earns Experte Skill points from successful missions. These can then be used to buy, at a cost of five per, skills such as timing, aim, luck, and break anywhere. On the other hand, your green pilots are penalized by one of these three: erratic, panic, and zeal. You can spend three Experte Skill points to remove the penalty during the game. The game also uses four decks of cards. Three of these are for different attacks: Nose, Tail, and Oblique. The fourth one is for Continuing Fire. These are as well done as the rest of the game. The cards are easy to interpret and there is little actual reading to be done on them. The game has blocks, that you have to sticker, to represent your Staffel's planes and auxiliaries. One thing about the game, you do have to keep a written log. You have to fill in a 'Pilot Roster' log, and a 'Staffel Log'. I am not really a big fan of these. However, I understand why you have to, and I admit that it does give you a sense of filling out the paperwork of a Staffel leader after each mission. There is so much in this game that I am only touching on a few points, and I feel as if I am only scratching the surface. I have been waiting for this game for a long time. It is a hackneyed expression, but in this case is very true. (and probable death) of a staffel into a game box. conclusion of each Mission, but if you choose to use it for your campaign, know this: it will make your campaign harder. The Luftwaffe lost the war, the ceiling over the Reich caved in, and over the course of a prolonged campaign the results of the Staffel Erosion Table makes that fact clear."